The more eagle-eyed among you have noticed that there are black keys and white keys. The black keys are set back from the outer edge and are raised. The white keys are shaped like rectangles with cut-outs to allow the black keys to fit in. Also, you’ll notice that some pairs of white keys have a black key between them, but not all of them. There’s a repeating pattern: a group of two black keys, then a space where there could have been a black key but isn’t, then a group of three black keys, and then another space. The black keys keep alternating in groups of two and three. The seven letter names A through G are assigned to the white keys as shown in the picture. The seven names repeat right along with the repeating pattern of black keys. 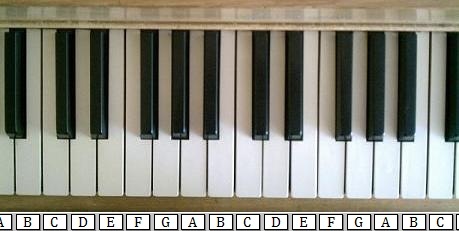 The letter names are the names of the notes you’d be playing when you press the white keys. For now we’ll ignore the names of the black keys’ notes. Suppose you want to find the key corresponding to the note C. Knowing the keyboard, it’s clear that any white key to the left of a group of two black keys must be C.
Now I’m going to assert that the distance in pitch between any pair of adjacent keys on the piano keyboard is the same. It is in fact a distance of a half step, also referred to as a semitone. Now consider the keys nearest to each other labeled C and D. They’re not actually adjacent, because there’s a black key between them. The distance between the C and the black key just to its right is a half step, and so is the distance between that black key and D. So the total distance between the C and D is two half steps. This distance of two half steps is called a whole step or a whole tone. You could imagine that someone looked at C and D and started off naming the distance between them a whole step, and then suddenly realized there was this extra black key between them. But wait, you say, what about those white keys with no black key between them, like E and F, and also B and C? Well, they’re only a half step apart, since they’re adjacent and there’s no other key between them. So the white keys on the piano are not all the same distance apart in pitch. Some are a whole step apart, and some are only a half step apart. Hold on, you say, isn’t that misleading? 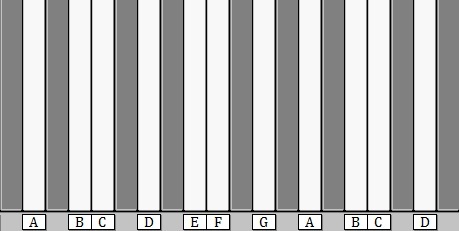 The white keys look like they’re all the same distance apart physically, but they’re not the same distance apart in pitch. OK, let’s fix that. In this wacky stretched keyboard layout, the distance between the keys actually does correspond to the distance in pitch. And with this information we can begin to understand how musical transposition works. To transpose a piece of music is to raise or lower its pitch by some amount. All the notes need to be raised or lowered by the same amount. Suppose we have a melody with the notes C–E–G and we want to transpose it up by a whole step. We already know that the distance between C and D is a whole step, so it seems that the first note of our transposed melody would be D. Let’s look at our wacky stretched keyboard. To transpose the melody on this keyboard, we slide it up by two keys. Since distance in the wacky keyboard corresponds to distance in pitch, you could imagine just putting your fingers on the C–E–G notes and sliding your hand two keys to the right. The C slides to D and the G slides two keys over to A, but when the E slides two keys to the right it ends up on a black key, the one between F and G. I’ll just tell you that in this context, that note would be called “F-sharp”. So if we transpose C–E–G up by a whole step, we get D–F-sharp–A. On our wacky stretched keyboard, you transpose up a whole step by simply sliding everything two keys to the right.